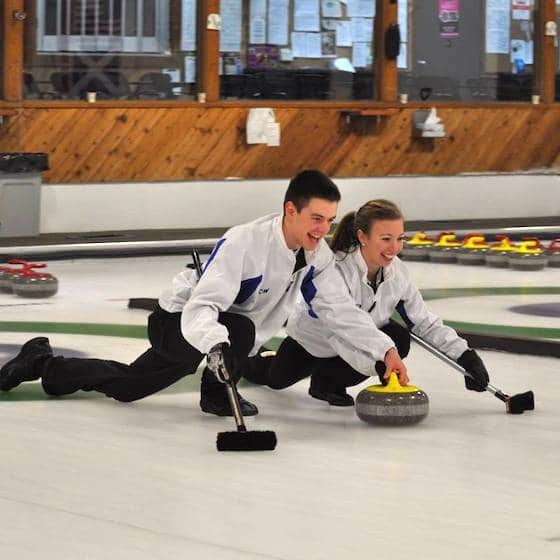 This week, John sits down with Tyler Tardi, skip of the Canadian Junior Men’s curling champions. Though Tyler lost in a tiebreaker at Worlds, his curling resumé is very impressive for an 18-year-old. 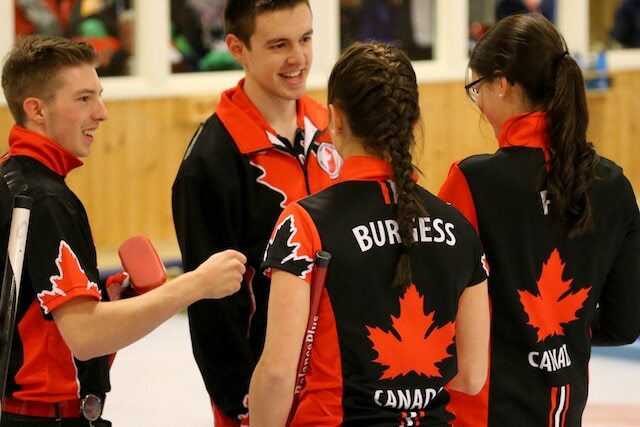 He has won the Youth Olympics gold medal, a Canada Games bronze, and two BC Mixed Doubles titles, in addition to his Canadian championship this year. He now sets his sights on the national U-18 title later this season. 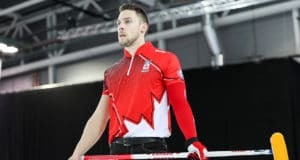 Welcome to Magical Question Fun Time, the Curling Canada feature where comedian John Cullen sits down with your favourite curlers for interviews like you have never seen. 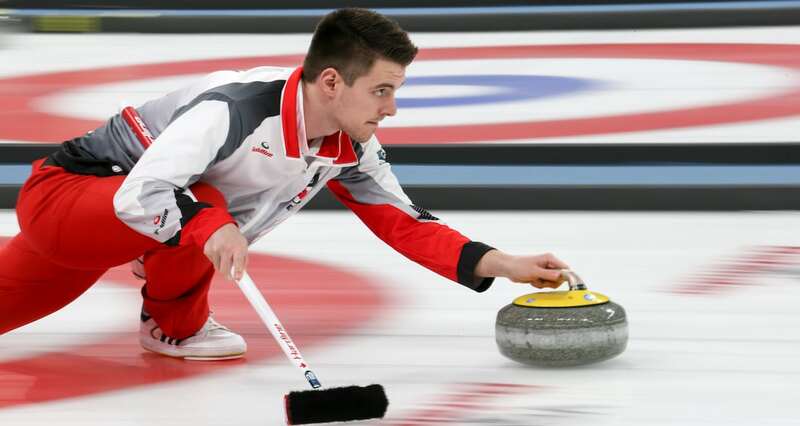 Each interview will feature eight questions: five standard questions that will be asked to each curler, two questions specific to that curler, and one question that the curler interviewed before them asks. 1. What’s the nicest shot you’ve ever been a part of? Tyler Tardi: Back when I was 13, we were playing in the A final of the juvenile playdowns against Kyle Habkirk. It was an extra end, and I had to make a slash double across the house to win. They had a rock in the top-eight and back-eight on opposite sides of the house, and we had one top-12 that I had to make count. There were guards and stuff in play, so there was no draw. John Cullen: And you must’ve been pretty nervous, I’m guessing? You’re 13 so this is probably your first playdowns. JC: [laughs] Oh my god. Thanks a lot, tips. TT: Yeah, so that didn’t help. Anyway, I made it. Probably given all the circumstances, my nicest shot. 2. Who could you take in a fight? TT: I don’t know, I know that a lot of people usually go for Colin Hodgson. You know what? They can just take it. If anyone wants to fight me, they can just tell all their friends they beat me, and I’ll say they did if anyone asks. JC: [laughs] You wouldn’t run? I have had a couple people say they would run. JC: Now you have curled with your brother pretty much forever. Are you saying you never fought? I thought for sure you would choose him. JC: I do remember playing you guys when you were younger and he played third, and you got into some pretty big arguments. TT: Yeah, we used to yell at each other sometimes during the games for sure. Siblings shouldn’t play back-end together. [laughs] I was 90 per cent of the problem, I think. But we’re making it work now. 3. If a deli named a sandwich after you, what would be on it? TT: Just lots of stuff. I love a huge sandwich. Four types of meat, two types of cheese, lettuce, cucumber, pickles, sauce, salt pepper. It would get serious. JC: That’s huge man! What kinds of meat and cheese? TT: Let’s go ham, turkey, sundried tomato turkey, uhhh…honey something? JC: So wait, you want two types of turkey and two types of ham on here? TT: [laughs] Absolutely. Maybe pepperoni, salami, and then Monterey Jack, cheddar, and mozzarella. JC: Now you’re adding stuff. It was already big. Is this how you order your sandwiches all the time? What would even call this? TT: Oh yeah, love a big sandwich. I usually have to jam it in my mouth. [laughs] I can’t think of a name other than one with a swear word, which I guess I can’t use. JC: Of course you can, I love swearing. 4. What’s the worst class you’ve ever taken? JC: [laughs] I’ve been there, my friend. So you are good with numbers, you’re getting a business degree, why can’t you get accounting? TT: It’s just very black and white. I usually like to operate in the grey area. JC: That’s fair. I’ve curled against you and watched you play a lot, and you like to curl in the grey areas too, you like to go for the tough shots. 5. What’s a stupid thing you incorrectly believed was true for a long time? JC: [laughs] Oh my gosh, that’s amazing. So what were you doing, just trying to touch the screens or what? JC: Where did you try to go? TT: I loved the big green hills on the Microsoft home screen, I wanted to hang out there. Too bad I never made it. 6. Now I have to say, I’ve known you for a long time, and the rest of the curling world is just catching up. I got a lot of texts about you during the Canadian and World Juniors talking about how calm you are on the ice, how focused you get. Talking with some friends, it sounds like you are serious on the ice, but I also heard a rumour you are incredibly ticklish. Can you confirm that? TT: [laughs] Oh boy, I think I know who told you that one. I am extremely ticklish, yes. My back is pretty much the only spot on my body that isn’t ticklish. Literally anyone could walk up to me on the street and tickle me and I’m finished. That’s my strongest weakness. TT: Thankfully it hasn’t been brought up in a job interview yet. [laughs] Fortunately, not that many people knew about it, I guess except for now. Maybe I should be worried that people will come up to me in the street and actually do it. JC: Yeah, or maybe I’ll have to use it against you in a game. You kids are getting to be way too good, maybe this will buy me an extra year or two before you win 20 straight provincial titles. TT: [laughs] I don’t know about that, we got a lot of work to do. JC: I am definitely still going to do it. 7. Normally I don’t reveal my sources for my questions, but in this case, I did approach your girlfriend and mixed doubles partner Dezaray Hawes (note: Tyler and Dez won the BC Mixed Doubles Title in 2013 and 2015) to ask for some information. She said you guys have a great relationship and you rarely fight, which makes sense given what you said above. However, she did say that your biggest fight ever was over a snowman. Care to elaborate? JC: I know you’re a competitive guy and I assume she is competitive as well…it’s never a good idea to put your relationship to the test in those situations. TT: Anytime I compete, it’s a bad idea. TT: So right away, I just got way too into it. The base took me about 30 minutes because I wanted to get it perfectly round. The middle piece took me just as long, and the head was close too. Honestly, I probably spent about 90 minutes on this guy. I’ll send you a picture, he was beautiful. I named him Henry, and I even put dirt around his mouth so he could have a mustache. TT: Oh, it was. So Dez had grabbed some carrots for her snowman’s nose, and she didn’t realize that I had already sculpted a nose onto my snowman’s face. So she figured she was helping me, and jammed the carrot into where his nose would be, and smushed it. JC: Wow. So she wasn’t helping at all. What did you do? JC: That is impressive. Remind me to never compete against you. Except for, you know, all the times we play each other. [laughs] Who ended up winning? TT: I was so mad we didn’t even end up getting anyone to judge. But I won for sure. 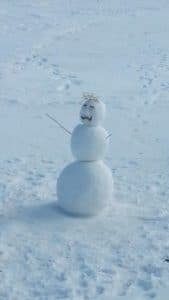 My snowman was unreal. I mean, look at that picture! 8. Okay, now the player question comes in from your World Juniors teammate Kristen Streifel, and she asks, if a movie was made about your team’s run this season, who would play you and each of your teammates? TT: I had to take some time on this one, but I think Morgan Freeman would play me. JC: [laughs] A 79 year-old African-American man? TT: I just really want him to narrate my life. [laughs] And then Sterling would be played by Kevin Hart because Sterling is short and has a sense of humour. Jordan would be Brad Pitt because we gotta get him a girlfriend, and I figure Brad Pitt playing him might be the best way. [laughs] And then Nick Meister would be played by The Rock, just because he’s ripped. JC: Awesome. Thanks Tyler, and can I get a question for my next guest? TT: What’s the strangest thing you’ve ever eaten? JC: Okay, nice one. Best of luck at the upcoming U-18s, and into next season, except when you play me! 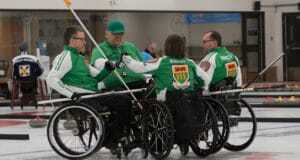 For more curling content, you can follow John on Twitter @cullenthecurler and Tyler @tardiparty.